Whoa, this is heavy! It's time for another RD80s Watch & Win Review featuring a game direct from the future! Our friends at Entertainment Earth have broke the space-time continuum by allowing me to review and then giveaway a Back To The Future Collector's Edition Yahtzee! 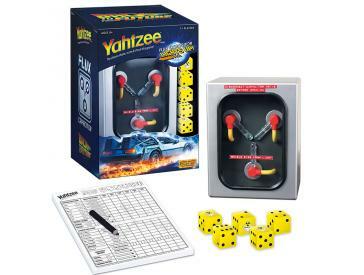 Back To The Future Collector's Edition Yahtzee is available now at Entertainment Earth or if you are feeling a little lucky, use the Rafflecopter widget below to earn up to 8 entries in the Watch & Win giveaway! You can also come back to this post over the next week and use the widget to tweet about the contest again to earn daily bonus entries. Deadline to enter is Friday June 17 at 12am CST. US residents only. Winner will be announced Saturday June 18 upon email confirmation. See terms and conditions for full contest details and rules. Good luck! a Rafflecopter giveaway Terms and conditions: Contest open to U.S. residents only. Giveaway retail value is $35. One winner to be chosen at random and contacted via email. Once a valid U.S. address is confirmed within 24 hrs, prize will be shipped to winner free of charge. If winner does not respond within 24 hrs, a new winner will be chosen at random. Winner's first name, last initial, and hometown will be announced on RD80s social media. Email addresses used only for future RD80s giveaway announcements. No third-party selling. By entering this contest you agree to allow up to 12 weeks for delivery, accept the fate of packages getting lost, stolen or damaged (neither Entertainment Earth nor Rediscoverthe80s.com are responsible for replacement or compensation either in product, credit or currency) and a correct, valid physical address must be provided (wrong address provided, unfortunately no shipment).